To eat fungi is to eat at the oldest table on the Earth. The evolution of fungi diverged from animals, which are closer relatives than are plants, a billion years ago, and fungi were probably the first complex beings on land. Indeed, fungal life underpins much of what we enjoy, by recycling nutrients, enhancing the growth of plants, and as yeasts used for bread and alcohol. 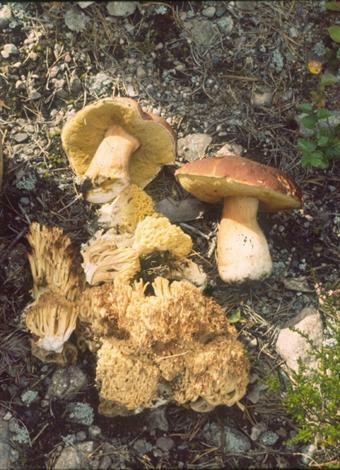 You who gather wild fungi are much more common across Europe than those who enjoy wild resources through hunting or fishing. You can be very important for maintaining and rebuilding the riches of nature if you are considerate for others benefiting from fungi, and especially if you join in activities to preserve and restore the habitats which provide your enjoyment. The Bern Convention of the Council of Europe has created a Charter for Fungi-Gathering and Biodiversity, of which this annex is a part. The Bern Convention was assisted by the International Union for Conservation of Nature (www.iucn.org); the whole charter, further advice and links to useful organisations can be found at www.naturalliance.eu. As a minimum, please read and observe the following simple Code of Conduct. IDENTIFY FUNGI: take a field guide and know the protected species as well as the toxic ones; don’t pick what you cannot identify; collect species that are locally common in preference to rare ones. RESPECT REGULATIONS: be aware of and respect “no picking” areas, which may be necessary where human population density is high; consult land-managers, especially at nature reserves. RESPECT NATURE: respect the need to leave soil and leaf litter undisturbed; allow fungi to open and release spores; leave those past their best; teach others to use these and other best practices. CONSIDER OTHERS: always leave one fruiting body for other humans (e.g. photographers and those monitoring species), for other species that need food (e.g. insects) and for fungal reproduction. AVOID WASTE: don’t pick more than you need; scatter trimmings where you pick; discourage others from wasteful damage to fungi, such as ‘off piste’ running, cycling and riding in woods where fungi are fruiting. PAY YOUR WAY: reward landowners, with thanks if not a small gift, for preserving the habitats that benefit you; if required, pay fees or make other contributions. HELP TO CONSERVE: assist with monitoring and restoring fungi and their habitats if asked; if possible, join organisations that provide guidance and organise conservation. Sfântu Gheorghe (Saint George) is a community at the mouth of the Danube that can be reached only by water. The main industry of fishing with gill-nets and multi-hook lines was severely affected by a 2006 ban on catching sturgeon. Biologists from the Danube Delta National Institute helped the local people to find possible alternative wild resources. 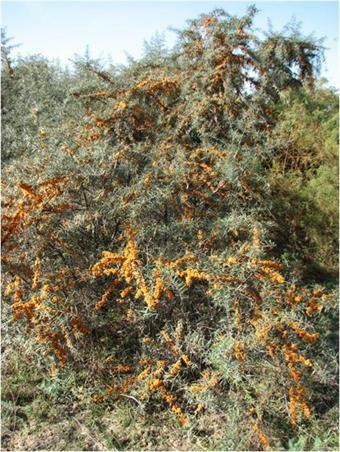 One possibility is a coastal bush, the sea buckthorn, which produces copious yellow berries used in foods, beverages and traditional medicine. Harvesting reeds is already a practical local industry, and it was felt that sea-buckthorn berries might have value at least be used to enhance the experience of visitors in a developing tourism industry. The local children therefore undertook a mapping project to estimate the area of buckthorn and hence the potential harvest value, using the mapping and GPS facilities available from Naturalliance. Many projects across Europe bring benefits to local communities that help preserve wild plant species. Some are registered as sustainable uses of wild plants in a FairWild certification scheme established by some major international conservation organisations (click right for Production Ideas). The project at Sfântu Gheorghe may or may not become a new success. However, whatever the economic outcome with sea buckthorn, all the local children will now look at this thorny bush with new respect and appreciation. Many wildlife-based activities, including fishing, hunting and bird-watching, also boating and accommodation, described in several languages through Google Translate. A large variety of cruising and hiking tours, described in several languages through Google Translate.